Olá a todos, eu gostaria de saber como faço para saber onde o cursor de digitação está dentro do texto como um todo. Hello everyone, I would like to know how do I know where the typing cursor is inside the text as a whole. 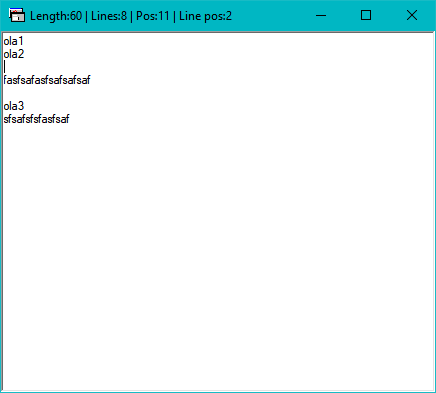 the text is still displayed in one line having 2 non-displayed chacters for cr and lf. what Kixforms Version do you have in use? Tested a patched version of 2.47.5 and now using 2.47.6. I think you made a typo in "multiline"
Test the code I pasted. Mulit line.... HA! Business in the front and party in the back. hahahh, funcionou no textbox, mas no richtextbox não funciona, veja. hahahh, it ran in the textbox, but the richtextbox does not work, see. What is it exactly that does not work for you? Hello, pardon me for the delay. The error is displayed automatically by an image, notice a column where it is and tell what it should actually have there. O erro estará autoexplicativo ao ver a imagem, repare a coluna onde está e conte o que deveria ter ali de fato. I hope they get an algorithm that works with richtextbox, it would be very useful for me, thank you in advance!! Espero que consigam um algorítimo que funcione com ritchtextbox, seria muito útil para mim, obrigado desde já!! Generated in 0.054 seconds in which 0.027 seconds were spent on a total of 14 queries. Zlib compression enabled.